Application: Glides Smoothly,Very Long Life,Premium Product for Refinish Professionals. Paintshops and auto refinish sectors are gearing up to meet the demanding global standards. Today, paintshops are the most sophisticated areas in any industry. Experts are finding every way to avoid dust in the cleanroom areas of the paintshop. Lint free cloths are imperative to maintain the clean standards of the paintshops. Being a customer oriented entity; we are affianced in providing a wide assortment of Tack-Rag Cloth. Our offered range is widely admired and demanded in the market for their quality features such as high tear strength and varied sizes. We are one of the reliable companies in this domain and are into offering Tack Cloth. Non-woven tack rags, impregnated to remove contamination on surfaces before spraying. Maximum dust removal due to large non-woven surface. Lint free. Specially designed for use with water and/or solvent based paint systems. Our company has achieved widespread recognition in providingTag Rag. Tak rags and lint free cloth are used to remove taks and dust from surfaces to keep them clean. They are used before painting or powder-coating in order to give a smooth finish. 'Non-Woven' Tack-Rags: For pre-paint wiping of all surfaces. Apply a very light, even hand pressure. Eliminates the smallest particles of dust, thanks to the adhesive substance. 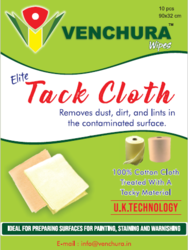 Tack cloth is cotton or non woven fabric impregnated with non drying varnish.